Looking for new Sockets & Switches? Need Large Sockets & Switches? Our range of large size sockets and switches are perfect when you need that extra bit more. From 95mm and up. 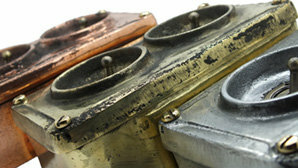 Compare swtches of our beautiful finishes - just click on swatch to see socket and switch styles in that finish. 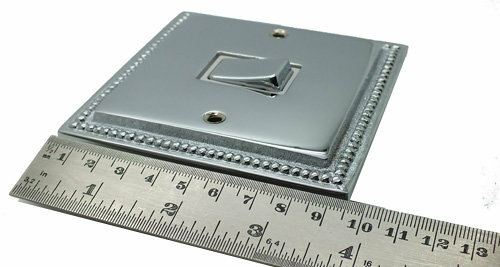 Traditionally cast, these sockets and switches capture the past modernity in a tribute to retrofuturism. Individually hand made from recycled metals, each is a work of art in it's own right. Very steampunk. RetroTouch Sockets and Switches are ideal for anyone looking for an affordable and stylish way to finish their home, office or hotel. They are modern, sophisticated and UK designed and provide that special touch to complete the interior designer look. Looking for something a little different? Look no further than our range of shaped Sockets and Switches. These iconic plates are available in a round Disc or Oval design and are offered in 6 different finishes. The unique shape of these plates will certainly catch the eye and offer a creative statement to enhance your interior design. 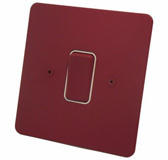 These shaped plates fit your existing wall box so replacement is easy and quick to install. 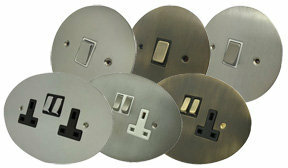 Everybody is talking about the latest "on trend" finishes for interior design including Sockets and Switches. Copper certainly fits into this category – these hard to find finishes are taking the interior design world by storm and you can see why. We offer 9 different Copper finishes, so you are sure to find something to suit your requirements. From Polished Copper, Brushed Copper for contemporary interiors to Antique Copper, Old Copper and Burnished Copper for period interiors we have something to suit. We also offer a range of natural solid copper and treated copper ranges if you need something a little different - View all our Copper Finishes. If you have a period property and require something retro that matches and complements the original design of that period, you need look no further than our ranges of traditional dome switches. 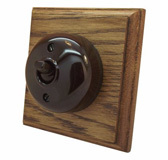 We offer 5 different wooden base finishes, and these are complemented by Brown or White Bakelite style dome switches or our range of metal domes in various Brasses, Chrome, Bronze or Copper. We also sell the domes individually if required. 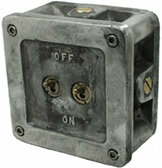 See our traditional Bakelite Dome Switch and Metal Dome Switch ranges. Choose from five wood mounts or just buy the dome switches individually. 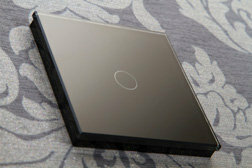 If you need UK standard sockets & switches and don't live in the the UK we can help. All you need to do is get in touch - email, live chat or phone - and we will be happy to help you find your perfect sockets and switches. Customers have choosen Sockets & Switches in Dubai, Malta, Caribbean, Cyprus, Bahrain, Malaysia and more. Use the menu above to choose your finish from popular Chromes and Brasses to sockets and switches in Bronzes, Black, White, Wood, Dual plus Clear Acrylic ranges.